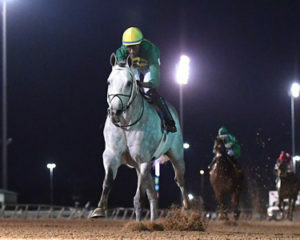 Mr Money Bags, who dominated in last month’s $65,000 Jim’s Orbit division of the Texas Stallion Stakes at Sam Houston, returned with an even more impressive victory tonight in the six-furlong $50,000 Groovy Stakes. The son of Silver City is bred and owned by Roy W. Cobb and drew off to a five-length victory in last month’s $65,000 Jim’s Orbit in a swift 1:10.86 for six furlongs. Trainer Mike Neatherlin was pleased with the ride by Ernesto Valdez-Jiminez and tabbed him aboard the 2-5 morning-line favorite. Once again, it was a comfortable trip for the gray colt, who drew off by seven lengths in an even faster final time of 1:10.35. Will S. Farish’s homebred Direct Dial, sired by leading Texas stallion Too Much Bling, won the 2018 Jim’s Orbit at Sam Houston for trainer Steve Asmussen and was named the 2018 Texas Horse of the Year. 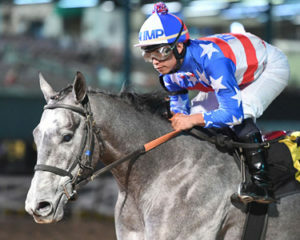 Confidently handled by jockey DeShawn Parker, the gray colt advanced gamely as he approached the top of the stretch and drew off by a margin of 5 ½ lengths. He was clocked in 1:10.75. Rider Eddie Martin guided Hes So Zazzy to a runner-up finish, followed by Galactica and 2016 Spirit of Texas Stakes champion A M Milky Way. Six fillies and mares were featured in the six-furlong $50,000 Yellow Rose Stakes with Shes Our Fastest, owned by Mark Norman and Norman Stables Inc., overcoming a troubled start to prevail as the strong favorite. With jockey Iram Diego in the saddle, the 4-year-old daughter of Oratory closed gamely to prevail over Zarelda in 1:11.40 over a fast track. Former jockey Beverly Burress, who has won two of her three starts as a trainer this meet in Houston, trains Zarelda, a 4-year-old My Golden Song filly, bred and owned by Billy Clevenger. Dark Desert Wine ran third and Sing Prada Sing completed the superfecta. Trainer Mindy Willis felt that her mare Texas Belle was poised for a good effort. The 7-year-old daughter of Angliana, owned by Richard P. Chandler, entered the feature in search of her third consecutive victory on the turf. Jockey Rudy Guerra guided her to the lead and outlasted Coraluna by a half-length in a final time of 1:45.82 over a firm turf course. The final stakes of the evening, the $50,000 Richard King Stakes for 4-year-olds and upward on the turf, produced the only upset on the card. Redatory, owned and bred by James Wessel, was making just his second start on the grass and gave jockey Rudy Guerra his second stakes win of the night. 2018 Houston Turf stakes winner Bonjour Baby and rider Sasha Risenhoover dueled with Redatory, but had to settle for second. Uncle Witt completed the trifecta, followed by Gottherightonebaby. 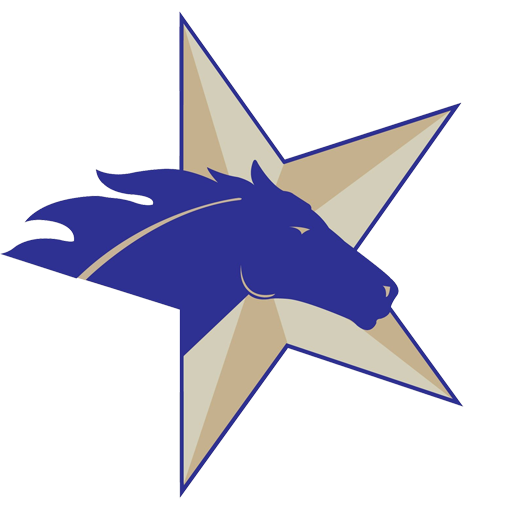 Hi Heat Boy, owned by Wayne Buehrer won the opening race of the Texas Champions Day card, named in honor of Double Your Flavor, a mare who won 17 races at Sam Houston Race Park in the 1990s.